PT MUGU, Calif. --- The Navy's newest variant of the Fire Scout unmanned helicopter completed its first day of flying Oct. 31 at Naval Base Ventura County at Point Mugu. "It is a big accomplishment for the integrated government and industry team to fly this air vehicle for the first time," said Capt. Patrick Smith, Fire Scout program manager at Patuxent River, Md. "MQ-8C will require fewer aircraft [than the MQ-8B] to operate at maximum performance and will meet the U.S. Africa and Special Operation Commands urgent needs requirement." 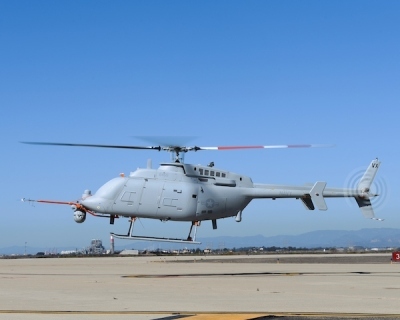 POINT MUGU, Calif. --- Northrop Grumman Corporation and the U.S. Navy successfully completed the first flight of the next-generation MQ-8C Fire Scout unmanned helicopter at Naval Base Ventura County, Point Mugu, Calif.